Last weekend students Katy Branston, Erica Mouch, and Liz Olszewski lost themselves in the beauty of the Umbrian countryside. Literally! 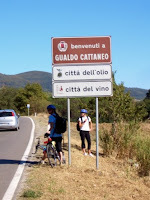 Rising early Friday morning, these connoisseurs of unconventional travel walked into “Ciclismo Sport”, rented three bikes, and peddled away with positive attitudes despite doubts in their a bility to read Italian road signs. 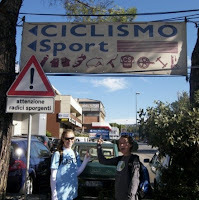 And, even though their doubts proved well founded, the 140 kilometer journey to Foligno couldn’t have been more fun. “Even when you’re lost, it’s beautiful…” says Katy Branston with a smile. Indeed, taking the “road less traveled” yielded views of olive orchards, vineyards, fields of sunflowers and even an Etruscan tomb. Aside from less hills, what more could you ask for?